The latest Doctor Who Christmas special doesn’t look to have wowed audiences in the UK, but it turns out Americans love combining their Doctors with superheroes. It’s the most-watched episode in BBC America history. The latest Doctor Who Christmas special, “The Return of Doctor Mysterio,” broke the ratings records for BBC America, becoming the most-watched telecast in the channel’s history. About 1.7-million people watched the holiday special on BBC America, and it was the most shared program on Christmas night across both Facebook and Twitter. “Doctor Mysterio” centered around the Doctor teaming up with a masked vigilante named Ghost to save New York (and the world) from brain-swapping aliens who are trying to take over the minds of world leaders. It included a brief nod to the next Companion, Bill, as well as the sometimes-uneven Doctor Who spinoff, Class. It also might be the last Christmas special helmed by showrunner Steven Moffat, who’s being replaced by Chris Chibnall after next season. Reception for “Doctor Mysterio” was mixed. Reviewers and fans cheered the fun and campy superhero themes, especially its nods to classic DC and Marvel characters and stories, but others found it somewhat lacking in emotional depth. However, given all the horrific stuff that happened in season 9 (as well as 2016 in general), maybe that’s not so much a bad thing. Even though “Doctor Mysterio” was a hit with American audiences, the episode might not turn out to be as successful in Great Britain. About 5.7-million people tuned into the special on BBC One Christmas night. Sure, it’s considerably higher than BBC America’s audience, but in comparison to previous British reception, it’s poor. It roughly matches the initial turnout for last year’s special, “The Husbands of River song,” which remains the lowest-rated Doctor Who Christmas special produced so far. 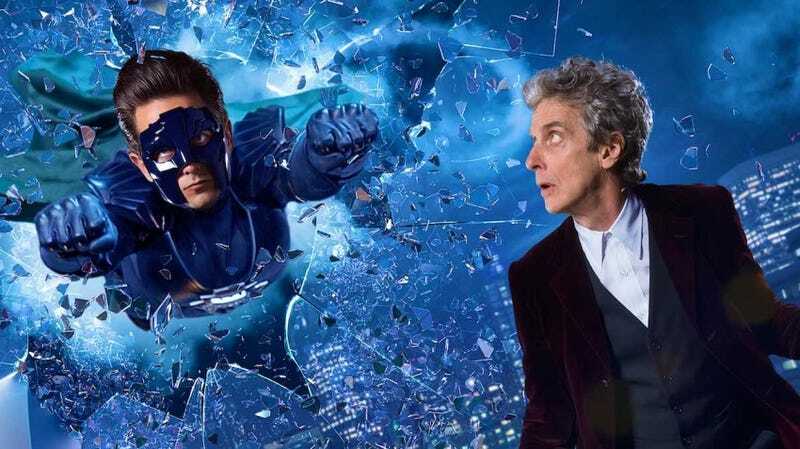 Unless “The Return of Doctor Mysterio” picks up more than 2-million additional viewers in the follow-up airings, it could be Britain’s lowest-rated Doctor Who Christmas special ever. There are a couple reasons why the special did better this year in the US, but possibly worse in Great Britain. It might be because American audiences like superhero themes more than British audiences, but it could just as easily be tied to Doctor Who’s still-growing popularity in the States. Only time will tell whether US audiences stay tunes into next season. Doctor Who returns for season 10 in 2017. Clarification: It’s not clear whether or not Moffat will helm the 2017 Christmas special, as Chibnall starts for the 2018 season.